I took a shower and we left to go to Bru’s Room off of Atlantic Street to meet up with Adam’s new interest, Allison, her sister and 2 friends. I was excited to order a Maker’s Mark on the rocks. It’s an impossible-to-find bourbon in Mexico. There were too many tiny ice cubes in the tumbler. I prefer to have exactly three ice tray sized cubes of ice. Of course, the glass has to be the appropriate size too. If the cubes are too small they melt too fast and it’s more difficult to drink. It’s also difficult to drink when the cubes are too big and then the ice doesn’t melt fast enough. One time I felt like there was an iceberg in my glass and it hit me in the face before I could pour the whiskey down. Of course I could use a straw, but I don’t like that either. We drove to another bar, Boardriders, where there was a guy playing covers on the guitar. They closed at two. Then Adam dragged me to a dry hookah bar, Ali Baba’s. We went to bed at 4. The next day we woke up and cooked a huge brunch, just like we used to do when we lived together. We had hashbrowns, omelettes, sausage, OJ and coffee. It was a lazy weekend, exactly what I wanted. In the afternoon we went to a Japanese garden, Morikami Park, walked around and threw the Frisbee about. It was too cold to go to the beach and besides, I was a little beached out. We made mojitos in the evening in preparation for Joya’s (Allison’s friend) Mom’s birthday party. At the party we ate a lot of food, played some sangria-pong and then the board game, Apples to Apples. For one of Adam’s turns, he pulled the word, “powerful.” I played my “Bill Gates” card thinking it was no contest. Someone else played “Madonna” that round, which Adam ended up choosing. I’m still bitter about that. Bill Gates is far more powerful than Madonna. 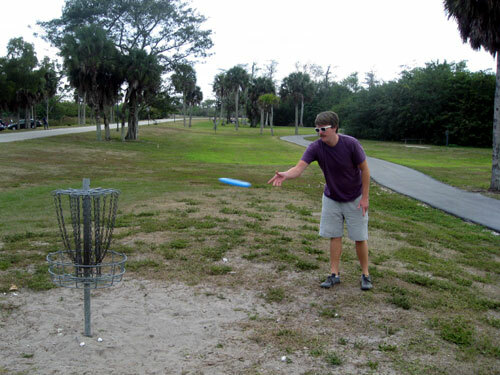 On Sunday we cooked another brunch in the morning and played disc golf in the afternoon at Tradewinds Park. I used to play disc golf every week when I was younger but it’s been probably 3 years since I last played. Adam didn’t have any discs meant for disc-golfing so we used regular Frisbees. It’s a good thing too, because on one hole I threw my disc 20 feet into a water hazard. A disc golf Frisbee would have sunk. I ended up swimming for it rather than abandoning it. We played 18 holes and Adam beat me by 3 or 4 throws. It was good times.